The Asimina Suites Hotel is a modern 5 Star luxury hotel with private beach. Elegant guest suites include pool or sea view. The Executive Suites feature private pool. Leisure and Spa facilities within the resort. Large luxurious 5 Star hotel complex with spa and leisure facilities. Beautiful guest suites. Excellent sea views. Private beach within resort. 2.5 km from Paphos fishing harbour and only 4 km from Paphos town centre. For more information or to check the availability of the Asimina Suites Hotel in Paphos Cyprus please click on the 'Availability Link' above and below. 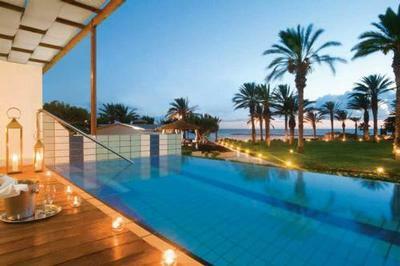 The 5 Star Asimina Suites Hotel is located in the Paphos region of Cyprus, 2.5 km from Paphos fishing harbour.